Preparation: Mix fresh yeast with 2 dl warm (not hot!) soy milk, 2 tablespoons flour, and 1 tablespoon sugar. Blend well and leave in a warm place to rise. Make dough out of flour, yeast, sugar, warm soy milk, oil, turmeric, and salt. Knead until it begins to produce bubbles and no longer sticks to the bowl. Let it rise in a warm place, in a covered bowl, for ca 30-40 minutes. If the dough is too hard, it will not rise, and if too soft, it will not roll nicely. When the dough has doubled in size, roll it out 2 cm thick. 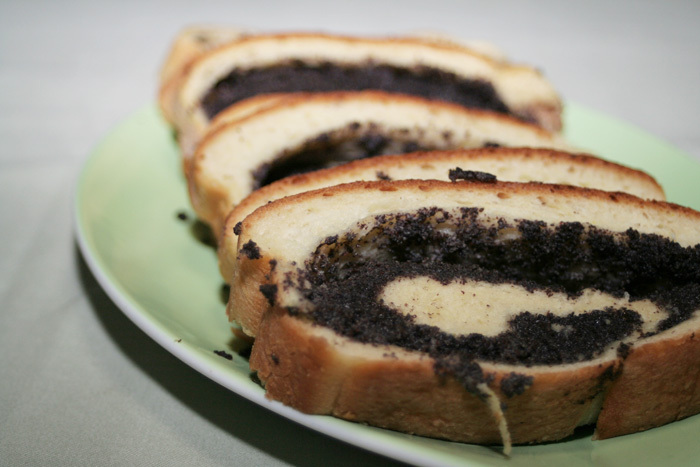 Make the filling out of poppy seeds, sugar, soy milk, and salt. Boil briefly. Add apricot marmalade (or another type of aromatic jam) and let it cool. Spread the filling and roll. Let it rise again for ca 15 minutes. Bake in a preheated oven at 180°C for 35-45 minutes. When ready, cover with a kitchen cloth and place onto a cooling rack.